Queens NY May 16, 2015: The Mets had scored 10 runs in their last five games altogether going 0-5 and throwing away a couple quality starts from both Harvey and Snydergaard in the Cubs series. So if today was ever a critical game and a “must win” the Mets not only proved a statement they also stomped their opponents the Milwaukee Brewers. It seemed like all of their recent struggles and frustration was let loose in what was a historic 4th inning for the Metropolitans as they were able to capitalize with key hit after key hit to score 10 runs in the inning thus leading them to a 14-1 win over the Brewers. 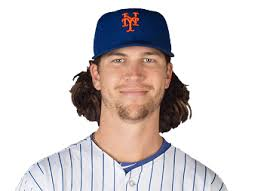 Jacob Degrom looked like the reigning rookie of the year as he started the game off with a strikeout of ex-Met Carlos Gomez that set the tone early leading to a degrominant start from Jacob both on the mound and at the plate. Degrom got things started early for the Mets in the second inning he came up with runners on first and second and 1 out hitting a dribbler up the middle just pass the reach of the shortstop Luis Sardinas to bring in Eric Campbell for the first run of the game. Degrom did not stop there coming up big in the fourth inning. The start of the historic inning was fueled by Degrom who collected his second and third hits bringing him a 3-3 night at the plate. Michael Cuddyer got things started in the fourth inning with a single on a line drive to right fielder Ryan Braun, Daniel Murphy followed with a walk moving Cuddyer to 2nd. Eric Campbell hit a grounder softly back to the pitcher moving the runners to second and third. Kevin Plawecki reached on a fielder’s choice, fielded by shortstop Luis Sardinas who elected to throw home where Michael Cuddyer eluded the throw to score the Mets second run. After Degrom hit a soft blooper over shortstop the bases were loaded for Wilmer Flores who was batting 9th in the lineup due to his recent struggles. Wilmer not only embraced his place in the batting order he delivered big hitting a grand slam (his 6th HR on the season) to center field. Daniel Murphy, Kevin Plawecki and Jacob DeGrom scored to increase the lead to 6-0. The Bleeding did not stop there as Curtis Granderson singled on a ground ball to shortstop Luis Sardinas. Followed by a Juan Lagares single on a line drive to right fielder Ryan Braun Curtis Granderson went 1st to 3rd. With runners on 1st and 3rd Lucas Duda drew a walk once again loading the bases for Michael Cuddyer who doubled (5) on a line drive to left fielder Gerardo Parra bringing in Curtis Granderson and Juan Lagares. With runners at the corners it seemed like Matt Garza had enough with the pitching Coach visiting the mound. Pitcher Brandon Kintzler replaced Matt Garza facing Daniel Murphy who kept the inning going with a double (10) on a line drive to center fielder Carlos Gomez bringing in Lucas Duda and Michael Cuddyer. Eric Campbell singled on a soft fly ball to right fielder Ryan Braun bringing in Daniel Murphy for the 10th and final score in the frame. The Mets continued the pounding hitting two more HR’s in the seventh inning one by Kevin Plawecki his 2nd on the season and a two run shot by Curtis Granderson his 4th on the season. The Mets had a season high in runs with 14 and hits with 16 breaking out of that slump that made them losers of 5 straight. After scoring 10 runs in their last 5 games the Mets were able to score 10 runs in one inning releasing their frustration and probably that funk that they were in. With Noah Snydergaard scheduled to take the mound tomorrow the Mets look to win the series and leave their woes in the past because the Nationals are just a half game out and streaking for first place.